Online Guitar Lessons That Work - Our Guitar Tricks Review | Zing! I’ve been playing guitar for 20+ years – I go in fits and spurts, I can go days, sometimes weeks hardly picking up a guitar, and other times playing a few times a day. I’ve realised to improve you have to be consistent. Having sudden bursts of activity then nothing for days isn’t going to help you improve in the long run. Short, focused playing, frequently is way better than a lot of playing sporadically. One of the best ways to stay consistent is to get into online guitar lessons. I’ve been learning from one off videos on Youtube for ever, and still do to this day. The thing is, however great Youtube is, it’s a bit of a lottery. For every great tutorial there are 10 rubbish ones. Whats more, the best guitar tutors are probably teaching online guitar lessons in sites like Guitar Tricks! One of the best online guitar schools out there is Guitar Tricks. It’s been around for longest (not that that’s any great indicator) and it’s got by far the largest number of lessons (again, no guarantee it’s any good). Who is Guitar Tricks Ideal for? ​Self-directed learners. People who are self-disciplined enough to keep at it. People who prefer a structured, organized learning solution. Those starting out with guitar or returning after a long absence. Beginners wanting to improve their chops. People who want to learn from a number of different tutors. People who want to learn a number of new genres and styles. People who want to learn a load of songs. You lack self-discipline and need a face to face tutor to keep you on track. You still have a computer from the 1990s. Guitar Tricks is optimised for speed, but using a dinosaur of a machine isn’t going to cut it. What Does Guitar Tricks Cost? What does full access give you? For a start, access to over 11, 000 online guitar lessons and a whole lot more. It’s going to cost you $19.95 dollars a month – see what that works out at in your currency here. Guitar Tricks offer’s a few nice incentives too. The first is a generous 60 day refund​ policy. Email them within 60 days of signing up, and you get your money wired back to you. The second is they give you the first 14 days for free if you sign up via this link. The third is a special treat for all Zingstrument readers. We’ve found a coupon code for the monthly subscription deal that takes a massive 60% off the first month! Pretty sweat hey. Just add the coupon code ‘60OFF‘ to where it says ‘enter your coupon code here’ when signing up for the monthly. Remember, once the first month of your membership is over, the price returns to the regular amount of $19.95. So 60 days money back guarantee, and first 14 days for free, they’re making it pretty hard to justify not trying it out! What Does Guitar Tricks Have to Offer? Ok, let’s really get into the detail for this Guitar Tricks review. The questions I would be asking are: Is it any good? Is it worth your time? Should you bother trying it? All the lessons are video based. Each video is professionally recorded, with multiple camera angles to assist learning. You can choose various streaming options to cater for low bandwidth users (still won’t help those using a relic from the 1990’s though – see reasons not to sign up above!). The instructors seem to know their stuff. They’re not professional recording artists as far I can see, but they are very competent. The main interface is divided up into four main sections. Covers everything a beginner guitarist might need, including tuning the guitar, learning basic chords, simple melodies, power chords, scales, barre chords and more. Experienced LessonsOnce you’re familiar with all the above, you ready to move into this section. The lessons are divided up into Blues, Country and Rock categories and have multiple lessons covering every element of the genre. Learn to Play SongsDivided up by genre (e.g. Bluegrass, Rock, Classical) this section is packed full of song tutorials. Learn Styles of GuitarDivided by genre, here you hone your skills in a particular style such as Blues or Jazz. One of the added extras you get with Guitar Tricks is a load of apps in what’s called ‘the toolbox’. They are complementary to the lessons, and some of them look a bit of a gimmick, but you’re not paying extra for them, so no harm done. More on that later. You also get a community style forum for asking the instructors stuff and conversing with other students. Toolbox – A selection of six apps such as a chord finder and fret-board trainer. >Forum – A community forum where you can share with fellow students and ask the instructors questions. The beginners section is made up for two modules. Guitar Fundamentals 1 and 2 plus some additional lessons. First thing to note, both the Guitar Fundamentals courses are made up of a dozens of lessons divided into seven chapters. Here’s a video I recorded of me walking through the site. You’ll get a good idea from this of what to expect. Let’s take a look at the experienced section. Made up of three styles, Blues, Country and Rock. Thi​s seems quite limiting I thought. Just three genres for the experienced section? Yes, Blues, Country and Rock cover a lot of material, but what about Jazz, Classical, etc? Many people just want to learn songs. Over my playing career I’m guilty too of focusing too much on technique (learning scales and arpeggios) and not focusing enough on learning songs. I try to mix up technique and songs these days. There is something more gratifying about learning songs – it’s a lot more pleasurable if you’re playing in front of people too. People tend to prefer hearing a song versus a mixolydian scale! Each song itself is broken into its component parts and is very comprehensive. ​Here’s for example the song ‘Summertime’ by George Gershwin. See on the right all the mini-lessons. Each one is a video in it’s own right! As well as songs, you can also focus on genres (or styles) in Guitar Tricks. This is great for the player that has always played a certain style but fancies trying their hand at a new genre. Let’s say your a metal head and wonder what Classical is all about, or your a Jazzer and want to try Surf. This is perfect for you. I clicked into the Bluegrass section, and this is what it looks like. What I like about this is you get a variety of instructors on the same topic too, which adds a nice bit of variety. The Guitar Toolbox is a group of apps to help the guitarist tune the guitar and practice. Some of the apps such as the guitar tuner can be found online by a simple google search, so i’m not that excited. You’ll find most online guitar lesson websites have forums, so this isn’t anything particularly mind-blowing. One good thing though is the instructors appear to be pretty active in the forum. I’d like to see a bit more engagement going on from student to student though – I’ve seen some forums WAY more active than this one. I also like to see students sharing recordings of their playing for peer review. Not much evidence of that. OK, so you’ve seen what Guitar Tricks is all about. Overall, it’s pretty impressive isn’t it. It’s far from perfect though. Here are my Pros and Cons. ​Design, speed and usability of the site is excellent. It’s been made even for muppets like me to use. ​Lessons well structured. Multi-angle videos are great for learning the right left / right hand techniques. ​Variety of instructors, competent, friendly. ​Clearly labeled ‘difficulty’ levels makes it easy to find the right level for you. 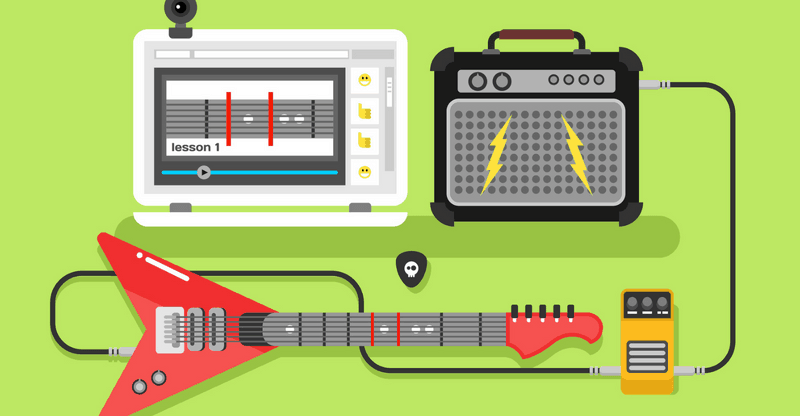 ​The apps are pretty cool, especially the Fretboard Trainer. Guitar Tricks is clearly catering for the beginner to intermediate player. This is fine, but the established player will run out of decent material eventually. Guitar Tricks is very broad. It covers most genres to a satisfactory level, but if you want to truly deep-dive into a particular genre, there are better alternatives out there (see below). Would be great to have featured artists teach lessons. On of its main rivals ‘Jamplay’ has artists like Kaki King teaching. Its completely missing one of the most exciting and fastest growing genre, Gypsy Jazz. This needs to be addressed. The forum is pretty quiet and doesn’t encourage sharing ‘user generated video’ for peer review. So that’s it for our mega Guitar Tricks review. If you’re like me, staying consistent is my biggest challenge and joining an online school like Guitar Tricks is the best way to keep regularly playing. The sheer breadth of Guitar Tricks is impressive, and you’re almost guaranteed not to run out of stuff to learn for quite a while! For the beginner, there’s nothing quite like it. If I had this when I first picked up the guitar at the age of 13, it could have been an altogether different story! What is Pearloid? And When Was it First Introduced?